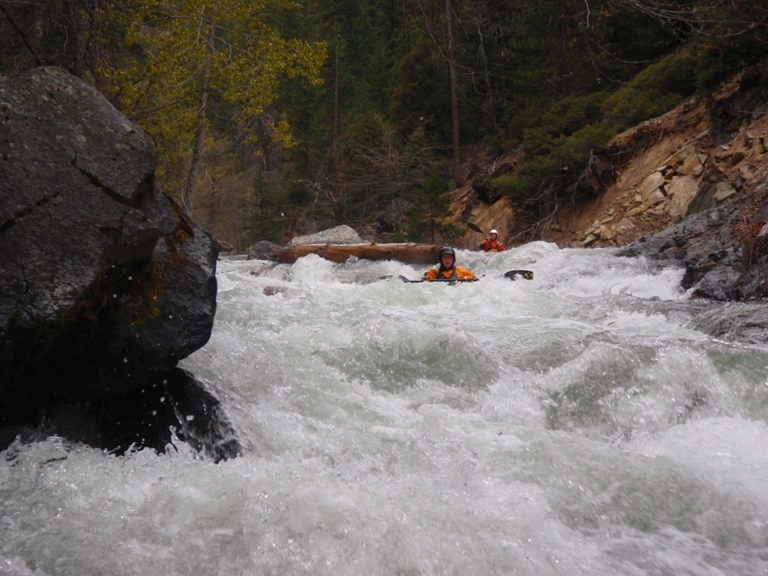 This run is one of the only nine-mile rapids in the state. There are absolutely no breaks in the white water. 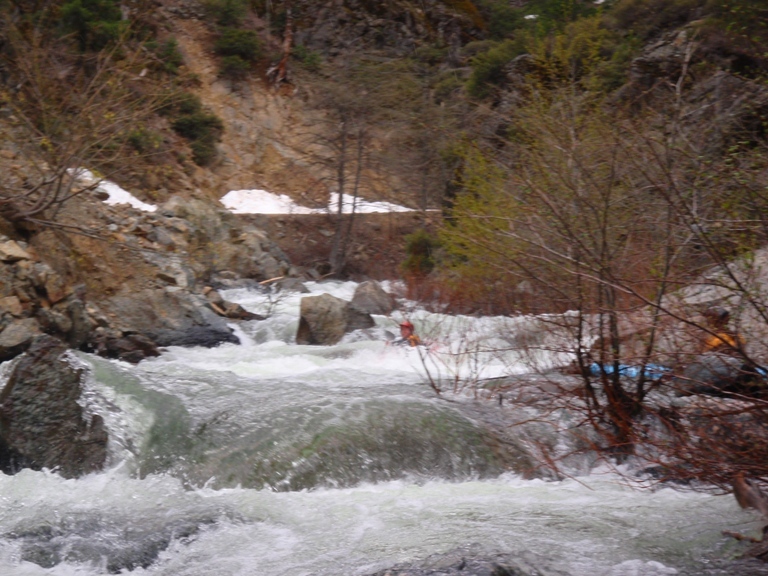 In between class III or class IV rapids are continuous class II rapids. Although this doesn’t sound like much, I do not know if I have ever been more tired from kayaking in my life. To further the difficulty, there are only a few micro- eddies to catch your breath in. With all this in mind I recommend that if you are not 100% confidant in your roll, do not run this river. Rescues would be extremely difficult, and boats would most likely have to be recovered down at Clair Engle Reservoir. With all that said, this creek is a lot f fun. 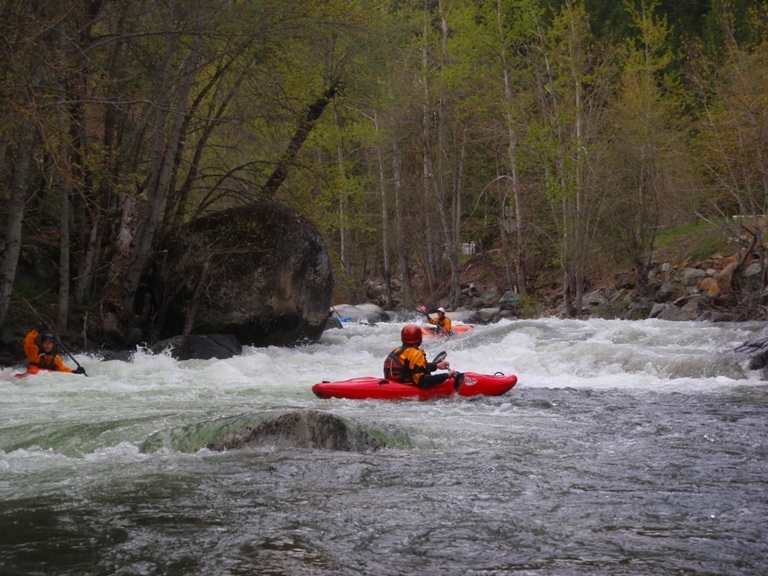 The most difficult thing about the class IV rapids is that it is near impossible to know when they are coming, therefore to scout them, or to catch your breath before you enter. When my brother and I first ran this Creek, we went into one such stretch with myself being out of breath. So as I fail in a ferry move after one drop, I flip, roll up, don’t have the energy to miss the next bad drop, dive straight in and flip again. As my brother is calling me to a small eddy, I cant muster the strength to paddle to it. Thankfully however, a few hundred yards later, I was able to finally make an eddy and catch my breath. In 2010 I finally returned to Coffee Creek, after 6 years. In the time since, I think I have become a better boater and have certainly seen many more rivers and creeks. This time I relooked at the map and discovered that 6 years ago my brother and I put in at the East Fork of Coffee Creek, not the North Fork. 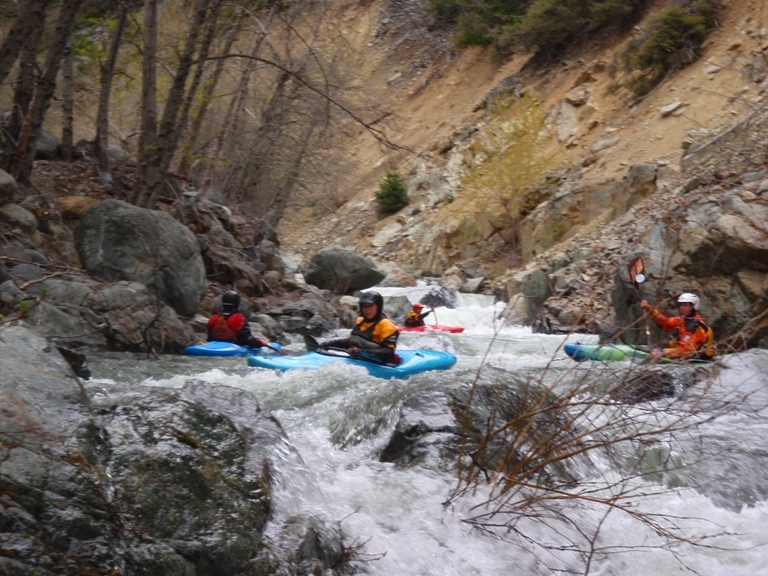 Furthermore, this time my friends and I opted to take our boats a mile above the North Fork to run more challenging rapids. You could certainly go further up Coffee Creek for even more excitement though wood becomes more dangerous the higher you go. The first mile down to the North Fork was class IV+ but continuous with occasional logs. It was certainly a serious place. 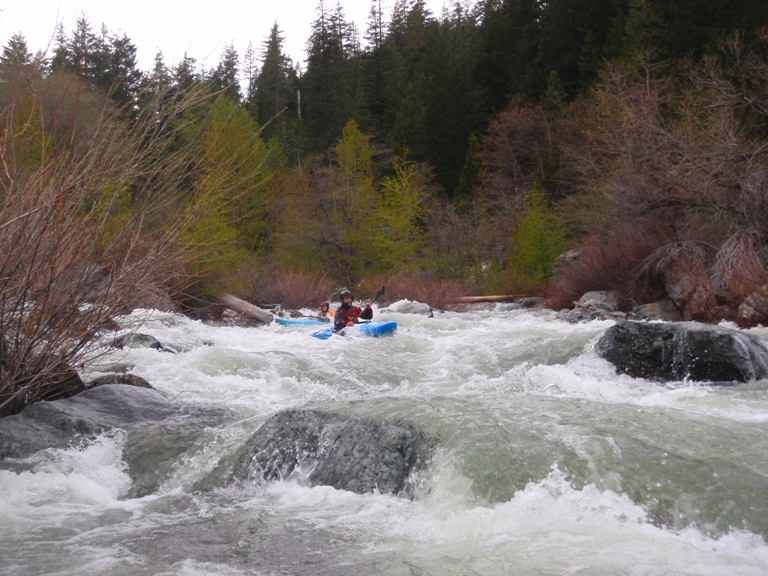 The mile between the North Fork and the East Fork likewise is harder than below the North Fork with congested and blind rapids. I would rate this section a solid class IV but causing the stress of class V-. Remember, don’t ever drop into something that you cant see an eddy to catch. 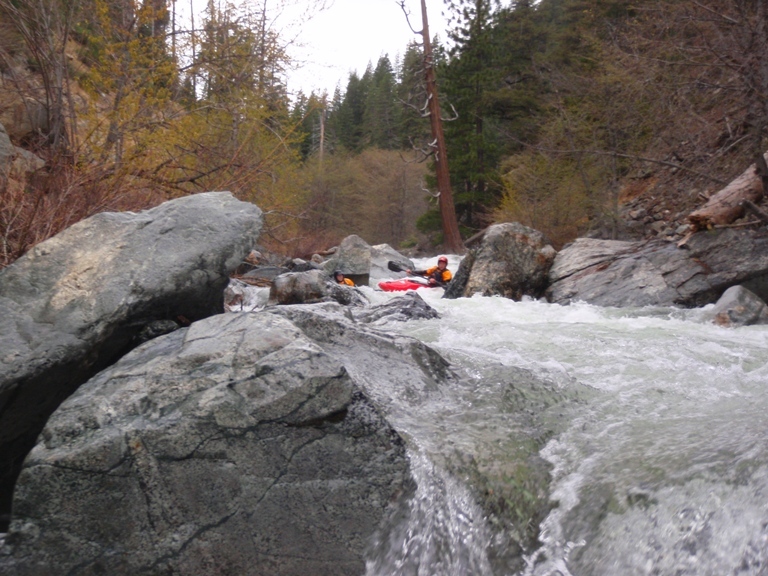 The final few miles below the East Fork were easier than I remember, though still fun. I think we had optimal flows for the top section (1,000 on the gauge), low side of good for the middle, and a bit low at the end. I wouldn’t want much more for the top as it is steep and continuous but near the bottom as the river widens out over the slopping mountain more water would be welcome. 1 (IV). I remember 4 or 5 distinct drops. I think the whole first section is only class IV, but it is so continuous that it ends up being a solid class IV+ mile that some class V friends of mine that were with us even stated as being stressful. The first was a double boof into a good size hole. 2 (IV). The second was a pinch against the granite wall on the left. This rapid also had a log in it so driving right and staying on top of the water is a must. 3 (IV). Around the corner was a read and run boulder bar with a sweet boof on the left over a hole. 4 (IV+). I just remember the pocket on the left and the sieve on the right. Neither looked friendly, but it wasn't too bad. 5 (IV). 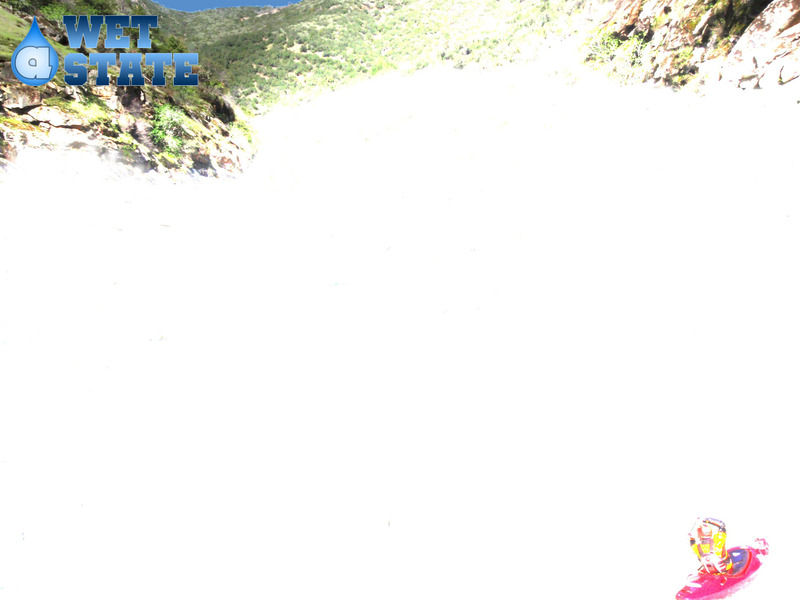 Next was a steep and somewhat junky rapid that we took down the right. 6 (IV+). Super junky with sieves and wood as the island splits. We went right then drove back left and then finished middle. You are now at the North Fork. North Fork enters on the left. Pinch (IV to IV+). I know there are more rapids, but I only have two that stuck in my head. This first one looks like it is potentially horrible. Luckily we had a probe or two that didn’t mind figuring it out for us and signaled that it was clear of wood. We entered down the middle and dodged rocks. Fun drop. On a Left Turn (IV). On a left turn there is a fun boulder bar read and run. We ended up on the left. East Fork enters on the left. 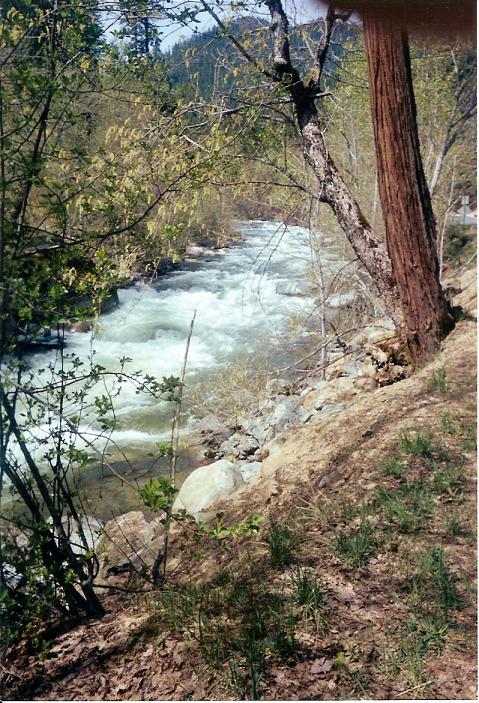 East Fork (IV). 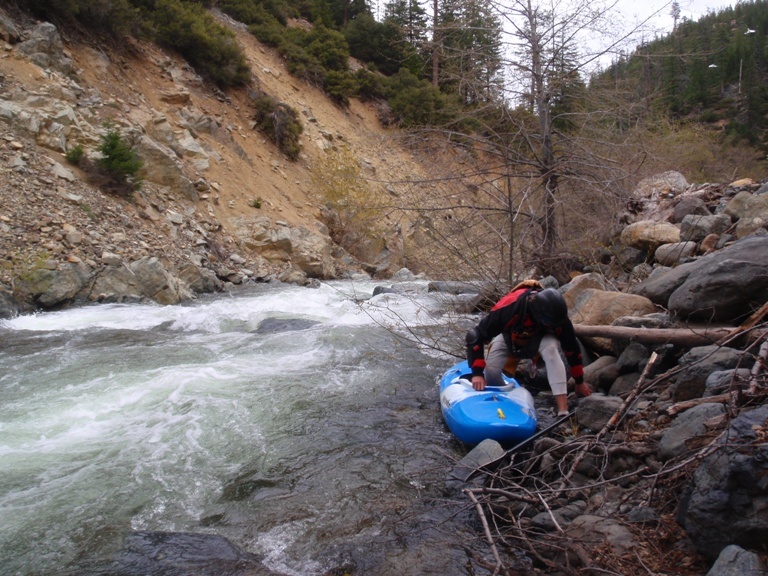 My brother and I put in at the bridge of the North Fork and immediately from our push off we were in a solid class IV rapid. We shot the shoot on the right of the big pour over. 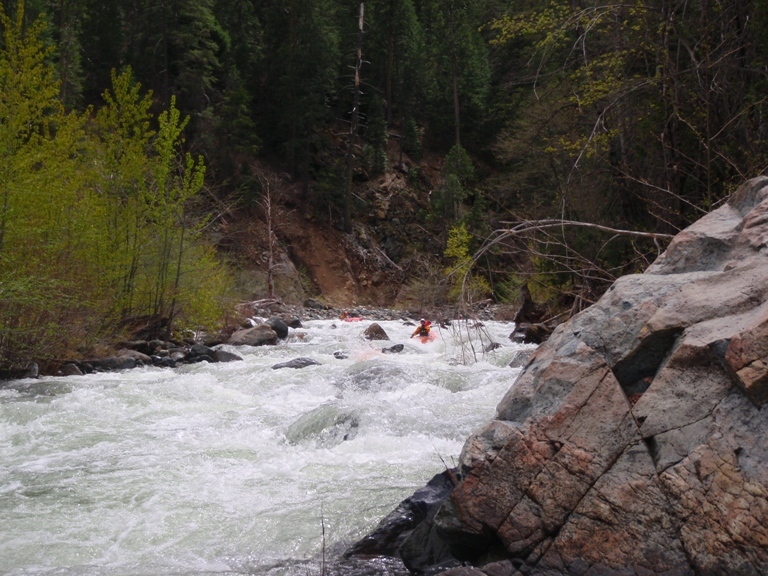 In this stretch there are at least two class IV rapids with numerous class III (basically all the river between the class IVs). The Resort (IV). 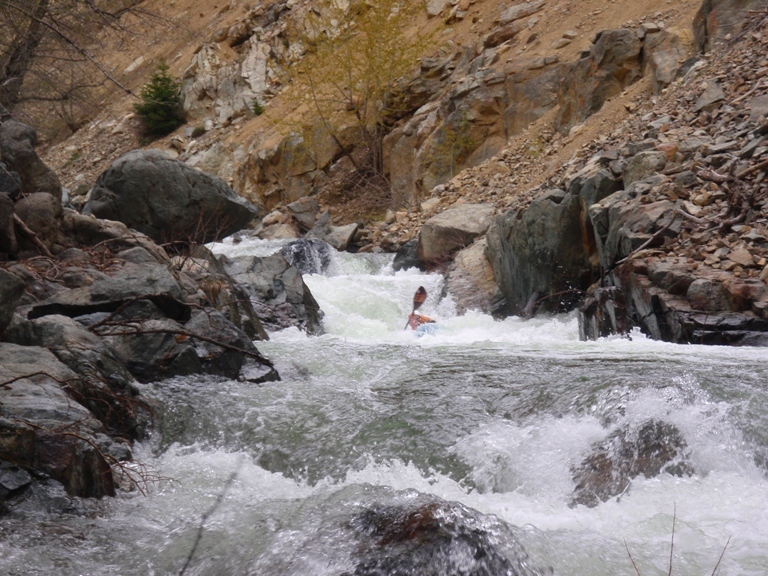 As you come around the corner above the Coffee Creek Resort you will enter one of the most difficult sections of the river. There are multiple drops that require maneuvering throughout. This rapid is scoutable from the road on the drive up to the put in. However, from the road the rapids look deceivingly easy. From here on out the river is mostly class II-III with one possible class IV. Caution: On the entire creek be aware of logjams. 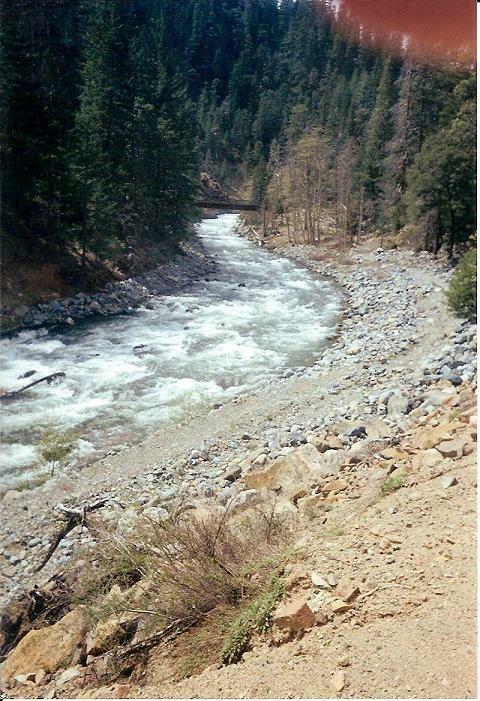 In 2004 there was a split in the river where both sides were chocked off by logs about 1.5 miles into the run. 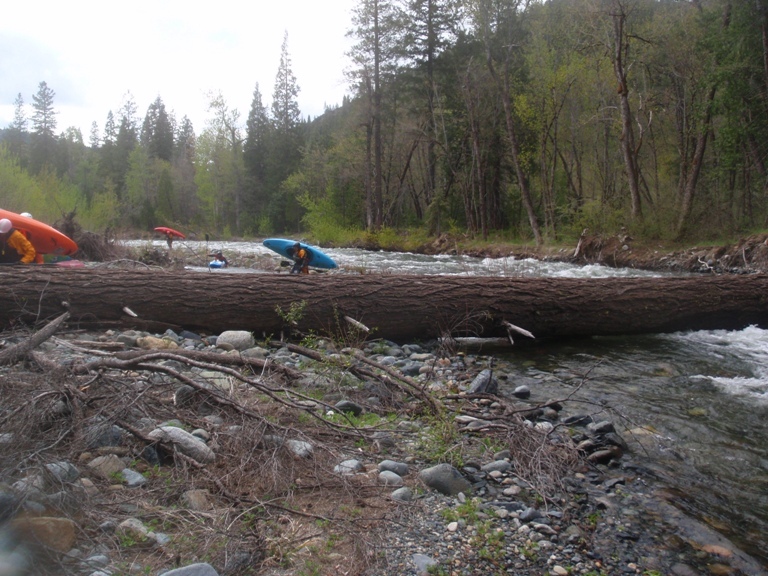 In 2010 there were 10 logjams, spread evenly throughout the section below the East Fork. Take out: From Weaverville, take Highway 3 towards Trinity Center. Follow this road for some 35 miles to the town of Coffee Creek. You can either take out at the bridge or you can go up the Creek a little ways. To go up further, turn left onto Coffee Creek Road on the other side of the bridge over Coffee Creek. About two miles up river we found a good spot where the road was close to the water and even had an eddy behind a peninsula to make matters easier. 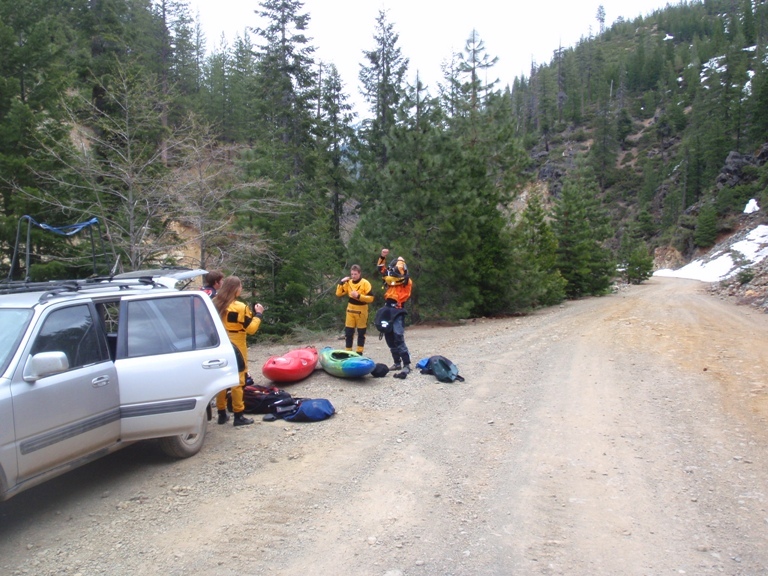 Put in: Continue going up Coffee Creek Road another 6-8 miles until you reach the bridge over the North Fork. You can put in here or go further up the road to the East Fork Confluence.